Natural Slate: Hook or Nail Fixing? The British Standard Code of Practice (BS 5534) specifies two ways of installing slates: nailing or hook fixing. These fasteners fix the slates to either batten, which is by far the most common English method, or to sarking board, which is commonly used in exposed areas in Scotland. Fixing SIGA slates is straightforward for an experienced slater. Most SIGA slates come pre-holed at a nominal 90mm headlap. By simply moving the location of the slate on a standard 50x25mm batten, these can be fixed to obtain headlaps between 76 and 96mm, allowing them to be used on a variety of pitches. Nails should be copper (to BS 1202 part 2) or aluminium (to BS 1202 part 3). In corrosive or marine atmospheres copper nails are preferable and in severe conditions silicone bronze nails should be used. The nail head diameter should be at least 10mm to comply with BS 5534 to minimise the risk of the nail head pulling through the slate. A 10mm head is only possible where the nail shank is 3mm diameter or greater. For Natural Slates, tiles and artificial slates, the shank diameter and length should be determined by the exposure of the site, the thickness of the slate, the nails withdrawal resistance and the manufacturer’s recommendations. Aesthetics – the nails are hidden beneath the rows of slate above, whereas hook fixings are visible. All natural slates can be fixed using slate hooks. The hook method offers considerable freedom in design and can save up to 25% on labour costs and eliminate breakages. The practice is very popular in Europe and is gaining popularity in the UK. With the hook fixing system, the slates are secured at the tail, thus providing strong resistance to wind uplift. To comply with BS 5534, hooks should be stainless steel, 18/10 or 316 (marine) grade, 2.7 mm gauge and at least 5 mm longer than the minimum lap required. Typically, slate hooks attach to the batten by a spike at the upper end, which is driven into the batten or a hook that wraps around the batten. The use of wrap hooks is not recommended. Only “spike-end” or nail-in hooks are permissible under BS 5534. The opposite end from the spike should have the form of a curved hook into which the slate fits. The shank may be straight or crimped, the crimps being in the same plane as the roof slope. Hooks with crimped shanks reduce the capillary rise of water at the perpendicular joints between slates. The peak to trough dimension of the crimp should not exceed 5mm. In accordance with BS 5534-2014, crimped hooks can be used to a minimum pitch of 25 degrees, straight hooks can be used to a minimum pitch of 30 degrees. When hook fixing, additional nail fixings should be used at eaves, ridges and top abutments and, to prevent lateral drift, at verges, hips, valleys and side abutments. Easy replacement of any broken slates. In centre-nailed slating, the gauge is the spacing at which the battens are fixed to the rafters, trusses or counter-battens to provide the required head-lap. The margin is the exposed length of the slate measured in the same direction as the gauge. The lap and margin will be the same. 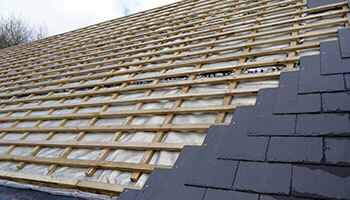 Centre-nailed slates usually require longer nails near the eaves, due to the greater thickness of slate. Where there is a gap between slate and batten, such as when tilt is provided at the eaves, longer nails are required unless thicker battens are used to take up the gap between slate and batten. Nail lengths in such cases should generally be equal to the sum of the calculated batten penetration, twice the slate thickness and any gap between the slates and the batten. The use of thin packaging laths is not recommended to fill the gap between the slates and the battens because they might split and, as a result, reduce the nail withdrawal resistance. SIGA recommend the nail length is calculated to achieve 20/22mm nail penetration into the batten, nails should not penetrate the back of the batten. Double-lap slates should have minimum fixings of two nails to every slate when centre-nailed. Nails should be of a diameter and length appropriate to the thickness of the slates held down and the position of the slates on the roof. As before, natural slates and stone slates the head diameter should be not less than 10mm, nails can be copper or aluminium and achieve 20/22mm penetration into batten. If you require guidance or a fixing specification for SIGA random slates, please contact your SIGA Slate Representative for advice. Now you’ve chosen a fixing method, use the Batten and Holing Gauges Table to confirm the correct Battening Gauge for your chosen slate length. Use these tables to confirm the distance between battens on your natural slate roof. We provide a free bespoke specification service for your project. Find out more about our Natural Slate Specification and Support Service. Hi, Just moved into a new terrace block of 7 houses, which has natural slates. Is it normal to get chattering sounds which I can hear upstairs in moderate windy conditions. Some of the slates don’t appear to lay perfectly on the adjacent/below slates, which you can see from ground level, again is this normal ? A “chatter” or knocking sound can be heard when slates or tiles are lifted by wind forces and then dropped back down again. It is generally more unusual in slate roofs as the slates are centre nailed and double lapped. It is possible the eaves slates are lifting as the wind catches them. With modern houses having rooms within the roof space this may also occur and notice with the top slate as that is also a single lap. A possible solution is to hook fix the top slate or apply an adhesive to the top slate if that is found to lift at the tail. The eaves slate is more difficult to inspect and remedy if it can be shown to be lifting. An adhesive can be used however caution is required to ensure it does no effect the ability of rainwater to disperse between the slates away from the nail holes.